We'll keep this brief, since it benefits no one to rant, especially this time of year when we should be more focused on counting our blessings and giving to others in need. Nevertheless, we feel the need to say something. Being mutts ourselves, and the progeny of a diverse mix of immigrants, we can't be xenophobes without also being hypocrites. We make no bones about our outlook. We are thrilled to have anyone, from any culture purchase and enjoy our products. 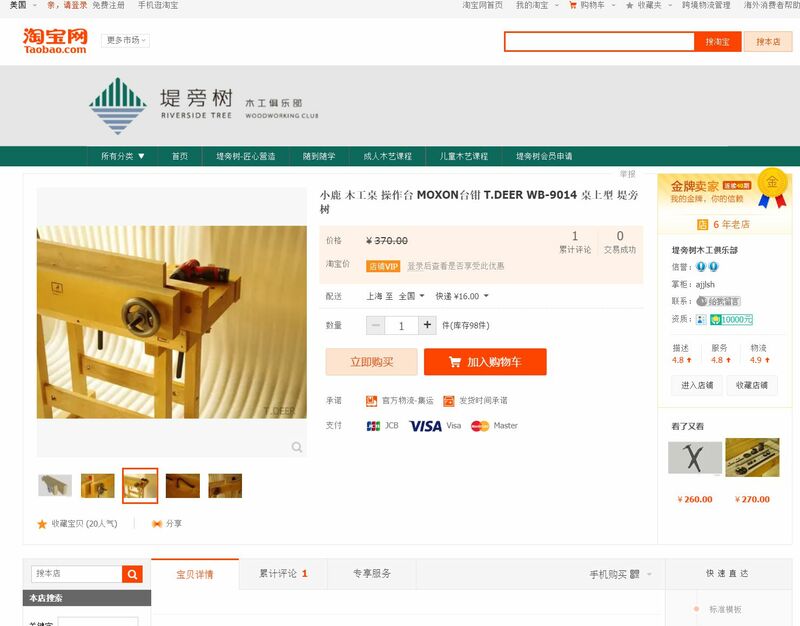 In the past few decades, Asia in general, and particularly China have developed a bad rap for ripping off products. But there are guilty parties on every side. Anyone who knows us, knows how deep we are into what we do. We don't simply make products to make a dollar. We make stuff we want in our own shop, stuff that works sweetly, then make "extras" for all our fellow woodworking enthusiasts. That's our "business model" in one sentence. So when someone takes your idea and turns it into a strictly commercial enterprise, made solely for the purpose of making money, it leaves an extremely bad taste in our mouths. Those who say that imitation is the sincerest form of flattery miss the point that flattery by definition is insincere praise used to further one's own interests. But we promised to keep this brief. 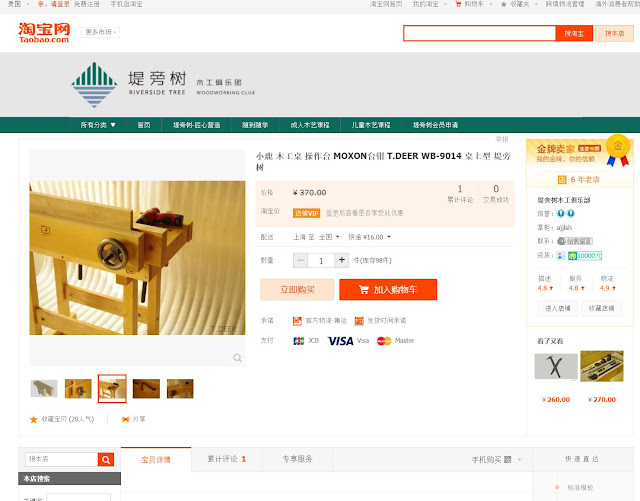 To the people at the China-based Riverside Tree Woodworking Club and those at "T. Deer" you seem to have the skills and means, we encourage you to develop your own products and designs to add value and diversity to the woodworking world. This is the first in what we hope will be a series of interesting posts on various topics related to woodworking or handcrafts. FARLEY AND LOETSCHER MANUFACTURING COMPANY. Once the largest mill working plant in the world! Dubuque, Iowa. Farley and Loetscher began humbly on January 1, 1875 when Christian LOETSCHER, a twenty-five-year-old Swiss immigrant, opened a mill working business. One of many expansions of the company occurred in 1882 at a cost of between $25,000 and $30,000. The saw mill was removed and that part of the business abandoned. The plans called for the buildings to extend from 8th to 7th streets. The warehouse would be on 7th street and join the business office which was to be moved to the corner of 7th street and an alley. At that time, the company's business had grown to such a degree that local lumberyards could not supply enough lumber. The problem was solved when Farley & Loetscher contracted for one million board feet of lumber from sites in Wisconsin. Loetscher pioneered the use of west coast white pine lumber in 1900 as the company branched out to markets around St. Louis, Missouri; Chicago, Illinois; Sioux Falls, South Dakota; and Des Moines, Iowa. In 1903 capitalization of the company was increased to $400,000 through the sale of bonds. Farley & Loetscher then invested a small amount in McCloud River Lumber Company of California. This company was then contracted for an annual production of ten million board feet of ponderosa lumber. Experimentation was being done by the millwork companies at this time. As the pine forests of Michigan were depleted, some millworks along the Mississippi experimented with spruce. This was discontinued when large millworks introduced ponderosa pine which was not rot resistant and needed treating. After being kiln dried, it was seasoned. Southern pine was rejected because of its high moisture content. In 1905 the company announced the construction of a solid block of buildings in Dubuque. The firm asked the city council to vacate the alley running through the block bounded by Jackson, Washington, Seventh and Eighth streets. It also asked for the right to lay track and switch to the right of the proposed new building. Business was slowing by 1908 and Farley & Loetscher only kept the California sawmill crews busy for seven or eight months. Once the lumbermen who owned the trees in California opened their own mills, the Farley & Loetscher mills were sold with most of the employees returning to Dubuque. In 1910 records indicated that the company annually produced 500,000 windows and 300,000 doors. In addition the company manufactured frames, mouldings, blinds, stairwork and interior finish. Between 1,200 and 1,500 carloads of lumber were used annually. The company owned and operated its own electric light company and maintained a crew of electricians to care for it and the telephone systems used in the plant. Nothing went to waste. Wooden shavings were advertised for those interested in horse bedding. By 1927, when the company was led by J. A. Loetscher, Christian's son, the firm occupied buildings covering twenty-three acres. The company also maintained subsidiary companies. 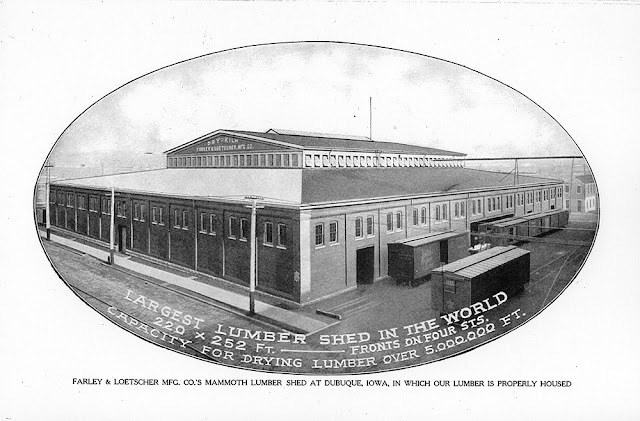 Loetscher and Burch Manufacturing Company operated in Des Moines. Another subsidiary was Roberts Sash and Door Company of Chicago. The company in 1930 was an employer of between eight hundred and nine hundred people. The seven company buildings covered five city blocks. Each of the buildings, except for three warehouses, were connected by bridges that crossed over the streets. 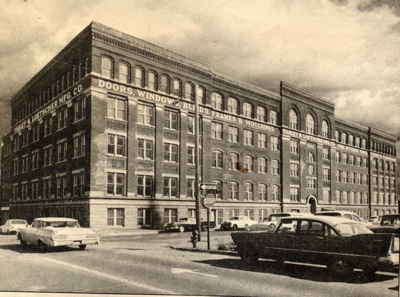 One of the structures was the largest building in Dubuque until the development of the JOHN DEERE DUBUQUE WORKS. In 1904 Christian Loetscher attended the St. Louis Exposition and bought forty huge timbers, each 13 by 11 inches and up to sixty feet in length, when the exhibition buildings were being dismantled. These were shipped back to Dubuque and used in the construction of a building described as "the largest lumber shed in the world." Thirty-two timbers were placed around the perimeter of the cupola while eight were spaced at intervals along the center of the building. In 1930 this building easily stored 6 million feet of lumber. Years before recycling became known, Farley and Loetscher gathered waste chunks of wood and all the sawdust. This was transported to the roof of one of the buildings to a funnel-shaped named "the hog." There the material was ground to fine dust which was carried to the basement. Specially designed boilers received the dust from a moving track. When burned this dust provided all the heat for the buildings. The company's electricity was generated by a dynamo within the plant. Unlike some companies of the time, however, there was no commissary so nearby businesses benefited from the purchases of food. A plastics division was added to the company's line in the early 1930s. This produced laminated plastics for decorative and industrial uses and once occupied three acres of floor space. (23) A newspaper article of 1930 especially praised a new product "Formica" which resisted heat, cold and water. In 1942 the company qualified for an "Honor Flag." Issued by the Treasury Department, the flag was issued on the basis of a company's employees participating in buying United States War Savings Bonds. More than 1,100 employees were purchasing bonds through payroll deduction according to Dubuque County War Bond Committee representatives. The end of WORLD WAR II meant that the production of doors, windows, and other supplies that had gone to the military simply shifted to civilian use. There was no need to replace equipment or retrain employees. The only problem was the need in 1944 to hire four hundred more employees due to the demand for products. In addition to new homes, surveys nationwide indicated that 34% of homeowners were planning renovations. FARLITE, a plastic sold to the government for use in signal corps radio equipment and table tops, would be provided for civilian use. Farley & Loetscher products include the main staircase of the DUBUQUE COUNTY COURTHOUSE; display cases for the ROSHEK DEPARTMENT STORE; millwork for the U. S. Navy torpedo boat Ericsson and Revenue Cutter Windom; the interior of the Willard Hotel in Washington, D.C.; and the outer doors of the main chambers of the Supreme Court Building in Washington, D. C.
In addition to being the first millwork in the city to utilize ponderosa pine and recycle byproducts including sawdust, Farley & Loetscher was the first factory in the city to have electric lighting and the first to be equipped with an automatic sprinkling system. Around 1903, the company was the first in the city to install a telephone switchboard. This is our first run of a planned several set series of vintage themed stickers. 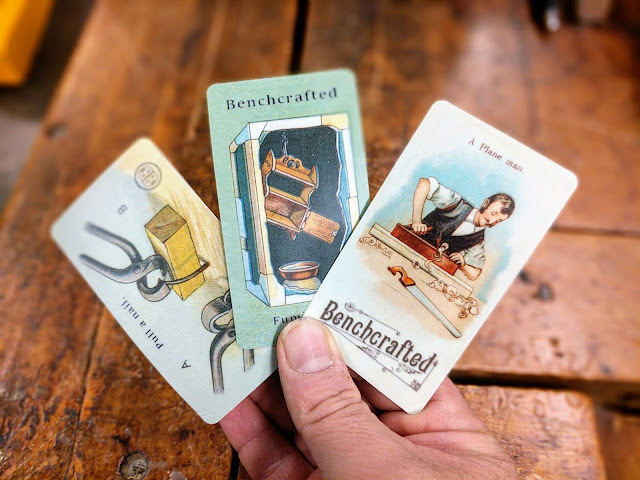 Some of you may recognize at least one of these from a set of cards we issued years ago as a promotion for one of the wood shows we exhibited at. We had mostly forgotten about those neat cards were it not for seeing a set at our brother from another mother's house, Narayan Nayar. So here they are, the first set of three. These are reprints from 19th and early 20th century cigarette cards, once included with a pack of cigs to stiffen the pack and provide a little amusement. We had considered including a stick of pink gum too but alas no one does those anymore. These should be ready to ship on our website Thursday morning. Price will be $6.00 for all three. Get a set, stick em' on your tool chest or anywhere you want to add some character. 2"x4".